NOTE: This story is written in an alternate X-Files universe where Mulder was not found until 5 years after the birth of Scully’s child. Disclaimer: The X-Files is property of 1013 Productions, FOX and Chris Carter. We just borrowed them to write this story. However, James belongs to mcee and I.
James made a face at her mother and sat up reluctantly, yawning dramatically. “Oh stop it,” Scully scorned mockingly, then busied herself picking up toys and clothing strewn across the room. She heard her little girl’s feet land on the thick carpet with a soft thud, and heard the closet door open, squeaking. Scully cleared her throat and went to the closet, peering inside over the child’s head. She rested both hands on her hair. “Ah, here we go.” Scully pulled out green corduroy pants and James’ favourite sweater, a multi-coloured thing her grandmother had gotten her for Christmas. It was almost worn through at the elbows. Scully put on one sleeve of her coat and grabbed her overflowing briefcase with the other, all the while herding child, bag of child and rest of self out the door to the elevator. “Yup.” Scully silently swore at the traffic. James looked out of her window and smiled happily. Scully hated D.C. rush hour traffic, especially when trying to get an uncooperative 5 year old up and ready to go to school in the morning. It was tough enough to get herself out of bed and ready to face the day, and then to look at young James, who looked like Mulder with every passing moment. Some days were harder than others. She still couldn’t figure out how she did all this on her own. Well, not totally alone. She had the help of the Lone Gunmen, Skinner, her mother. But without the help of the most important person that should’ve been there – the father – James’ father, who was still missing. Almost 5 years to the day. James was chattered on about what she was going to do in school that day, her new best friends, the guinea pig in the classroom and all Scully could think of was Mulder. Mulder who used to chatter in the car about the latest case. Mulder who used to stake out liver eating monsters in his spare time. 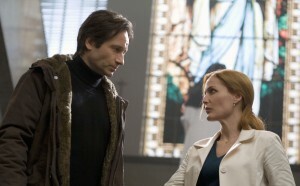 Mulder who trusted her with his life…and that last time, in Bellefleur, Oregon, Scully felt as though she let him down. While deep in thought, driving James to school… Scully wasn’t paying close attention to the traffic. James quickly got bored of the dull urban scenery and turned back to her mother, intent on jump-starting the conversation again. She was the talkative one. Her mother had always been silent when unprompted. James’ grandmother had once told her that she hadn’t always been like that. She had left it at that, and James had known better than to open old wounds. The disappearance of her father was only a hazy concept to her, but she was conscious of the effect it had on her loved ones. Especially the strong woman next to her, who seemed at times a walking contradiction. As she looked at her now, and didn’t feel like unleashing a barrage of chatter upon her; there were times where she looked weary, her jaw shut tight, eyes piercingly focused in front of her, her body in a constant state of tired awareness. James sometimes wished her mother would rest. “Mom?” she tried, when they rolled to a quiet stop at a red light. Scully swallowed awkwardly and tucked her short red hair behind each ear, looking sideways at her daughter. “What I’m thinking about? Well…” She looked back at the stopped traffic in front of her. “I’m thinking about a case I’m working on. I’m thinking we have to buy you new shoes. I’m thinking… I’m thinking I need to talk to someone. Anyone. I need your fath-” She stopped, not abruptly, but just fell silent. “I’m really really tired, James…” she breathed out, not really to anyone. A genuine smile crept on Scully’s lips and she looked at her. “You? No way, babe. We girl stick together. Right?” She covered the child’s fist with her bigger hand and winked at her. She didn’t know when she started acting and talking like Mulder. She only did it with James. There was probably a very obvious psychological reason behind it, but she didn’t question it. It felt right. James looked at the hand that was wrapped firmly but lovingly around her own. These were the days when she just couldn’t figure out her mother. One minute she would be this person who thought about everything scientifically and logically. Then the other days, she would be just plain silly talking about ghosts and aliens; all things James watched in her favorite cartoons. But, there was a certain time of year when her mother became distracted and detached from the world and this was that time. James thought when she got to school, if she ever got there, she would check the class calendar to see what day it was. Maybe her teacher marked it there. As Scully took her hand away, put it back on the wheel and began to drive again, James felt sad. Why didn’t she turn on the radio or put one of her favorite tapes in, like she did every morning? The silence was just about killing her. What did her mother mean by “We girls stick together”? And why did she stop talking when she was just about to say something about her father? That hurt James the most. “Where is my dad? Why isn’t he here with us? Where did he go for so long?” Those questions plagued her for as long as she can remember. Once she brought up the subject of her father to Scully. Scully’s eyes filled with tears as she tried to tell James about her father, but then couldn’t finish. All she could say was “He was a loving and strong human being that protected me to the best of his abilities.” That topic was still an emotional one for her. But that answer wasn’t enough for James. She wanted to know more about him than just looking at the photographs that scattered the apartment. Actually, no one ever went into great detail about him. What were they hiding? Was he in trouble? How could she be worried about someone she didn’t even know? “*sigh* This wasn’t going to be a good day,” thought James as she stared back out into the same, dull urban scenery she saw 10 times per week. Scully found herself counting the blocks that were separating them from James’ school. She needed her daughter close, she always had, but this wasn’t fair to James. Scully didn’t think she could keep up a normal conversation right today, and she would never forgive herself were she to drag the child down with her. She became alert again, and finally spotted the school, small herds of colourfully dressed children crossing the street and playing in the yard. She wanted James there, with them. The government-issued car pulled up by the curb behind a school bus. James undid her seat belt and grabbed her bag. “Yeah. Can you pick me up tonight or should I take the bus back?” she asked softly with a subtle squirm. She hated the bus. Her mother hadn’t yet caught on to the fact that she didn’t have much friends and that the only people who ever paid attention to her did only to mock her. “Well, I’ll try. Look for me when you get out, okay?” She ran her hand over the child’s arm, smoothing out non-existent wrinkles. The look in her eyes did seem loving, beyond the wariness. James nodded and grinned, mostly to her mother’s benefit. “Okay! Bye mom!” she added as she jumped out of the car and slammed the door behind her, running to the door. James wasn’t sure what she was running to. Scully watched her until she disappeared inside the old building, then pulled away. Scully retraced her steps and went exactly where she intended to be today: back home. Now that her daughter was gone, she didn’t bother to hold back the tears. After James scurried into the building, she peered out the window and watched her mother drive away, expecting to see her drive towards the direction of the F.B.I. Headquarters. Instead, she saw her turn around and drive back to their home. “What is she doing? Did she forget something?” James thought, as her hands loosened up on her belongings. She really didn’t want to be in school today. Come to think of it – she never wanted to be there. Her mom had too much on her mind to be bothered with her “hating school” problem and what could she do anyway? She tried to just “grin and bear it” and pretend that she liked going and had lots of friends, but wished she was someplace else. “Someplace, like maybe with my dad,” she thought. How she longed to know her father. While deep in thought and staring out the window, someone grabbed the lunch out of her hand. “What’s the matter little spooky chick Scully?! Did you forget your lunch?” said Seth Taylor, as he held it above her and out of reach. “Gimme that back!” James jumped to reach her lunch, but Seth was bigger and stronger than she was. James wanted to cry, scream and hit him all at once. Just then, a teacher, Mr. Harrison stepped in. “That’s enough!” yelled Mr. Harrison. Before Mr. Harrison had a chance to ask if James was okay, she picked up her stuff and ran to the nearest girls restroom, hoping that no one would be in there. She locked herself in a stall with her back pushed against the door. “No! I must be strong! Must not cry! For mom’s sake!” she thought, fighting back tears. Everyday there was an episode like this – either the kids made fun of her for having an F.B.I Agent as a mother or the lack of her having a father. She didn’t know which was worse. All she knew today was she wanted her mother to pick her up from school. After about 10 minutes, she composed herself, left the restroom and walked slowly down the hall to her homeroom. From her seat at the back of the classroom, James did her best at drowning out her teacher’s voice. She rested her chin on her folded arms and squinted at the picture on her desk. She could barely make out the blurry image from between her dark lashes. She blinked her eyes back to normal, then tried crossing them slightly, rendering the picture out of focus and merely undistinguishable. She smiled satisfyingly, then closed her eyes and opened them again, this time to look at the picture unmorphed. This was James’ favourite thing to do in school. First grade seemed ridiculous to her, since she was perfectly able to read, count and tell trees apart. It was hard to pay attention to anything, including the other kids, who were a year older than she was, and stupid. James played it dumb for the most part, for fear of being bumped one more year ahead. She liked to lay low, and didn’t care much about being singled out as the smartie pants. When classes began, she would take out her books, open them were required, then slip the photograph on top, her eyes rarely leaving its surface. This was her favourite because she was sure even her mother didn’t know it existed. She had obviously been aware of the camera when it had been taken, but James suspected the momento had long been forgotten. She had found it at her grandmother’s house, in the piano seat, amongst random discarded family pictures. James’ father, that tall man she knew so little about, had taken her mother in his arms and had held her against him lovingly, long enough for a photograph to be taken. They were both looking at the camera, smiling. His smile was sneaky and toothy; hers was shy, understated, but obviously just as blissfull. The background was her grandmother’s kitchen, and Christmas decorations were hung around them. She had studied this image so thoroughly. She kept coming back to the same details, the details that grabbed her attention, the details she instinctively found comfort in. Like her father’s posture, protective, slightly bent forwards over her mother. And her mother, blushing with joy (or perhaps, she would realize years later, because of the glass of wine dangling from her fingers against her thigh), leaning into the embrace only a little, so typically her, but at the same time relinquishing to him a trust James had rarely seen her exert towards anyone else. She also liked to focus her attention on her father alone. How tall he seemed, especially next to her mother. The sleeves of his shirt were rolled up on his forearms, and the topmost buttons of his collar undone. His hair had a boyish quality to it, ruffled every which way like it badly needed a haircut. James imagined her father strong, strong enough to pick her up and swing her around. She imagined his smell, which would be soft and warm, familiar. She imagined how his stubble would feel in the morning against her face. For the second time today, she fought back a wave of sudden tears. She never wanted James to see her like this. It would only upset her before she went to school. She might be intellectually advanced for her age, but was still only a 5 year old child. Scully tried not to show this side to James and would hold it until James was away. While driving back to her apartment, she decided to take a detour and go to the place she always went when feeling like this. It had long been lived in since his disappearance, but kept up for his anticipated return. That return became more of a wish instead of a fact with Scully. After the first year, she told herself that he still had a chance. By year four, his file was closed by the F.B.I. as “unsolved” and the search party gave up on Special Agent Fox Mulder. As far as they were concerned, he no longer existed. So far, it never happened, but she wished it would. It was like her life stopped 5 years ago. Scully pulled into the parking lot. She composed herself before calling Skinner on her cell phone to say she would be late, and walked into the building. She opened apartment 42’s door with her key. It was a quiet place to be, now that Mulder was gone. Things were missing in the apartment from the original search and the fish died. There was no excuse now to come over to feed them. However, it was a place where she could gather her thoughts and “talk” to Mulder. She always felt his presence when she was there. Scully sat down on the couch, grabbed the throw that Mulder once used to cover her, put her head in her hands and cried. She had to get this out before she could work. She raised her head, looked around the apartment and started to speak. “Oh, where to begin…I’ve been having a bad week. It’s the anniversary of when, uh,” she sniffed the tears back, “you disappeared and I always have trouble during this time. I hate to upset James with this. She knows something is wrong, but I haven’t told her what it is. She’s too young to be put through this. She asks about you and I try to talk to her, but I just can’t bring myself to do it without getting upset. You would be so proud of her. Scully had a chill through her body. It was like she felt someone was with her while she was talking. Never a strong feeling like that was felt there before and attributed it to her being upset. She shivered and continued, “I’ve been alone for so long and I’ve given up hope that you will ever return. You’ve missed out on so much, in your life, mine and especially James’ life. She really needs a daddy and you would be such a good one to her, if only you were here,” Scully began to cry harder. After about 20 minutes, she couldn’t cry anymore. Scully went to the bathroom, washed her face, grabbed her keys, purse and left for work. Scully never heard the squeak of the floorboards from inside the apartment when she closed and locked the door. James was sitting in on a couch in the hallway by the nurse’s office, staring at her shoes. There were situations where looking up was just a flat-out bad idea. She squirmed uncomfortably, wishing the couch wasn’t upholstered in vinyl. “James, sweetie…” Her teacher’s voice came to her, soft and whispered. Ms. Summers was a kind young woman, with only a couple of years of teaching experience behind her. James liked her, but preferred to see her as a pleasant girl instead of her homeroom teacher. Today Ms. Summers had taken James aside for a ‘talk’. Deep down James knew she couldn’t possibly breeze through years of grade school with her head down, staring at a picture. But while she liked Ms. Summers enough, she couldn’t bring herself to be cooperative. She remained decidedly silent. “I don’t need a shrink,” James pouted. Kids had told her she did, and she was quite aware of what shrinks did. Her resistance, however, was very thin to begin with, and even as she said the words, the idea of talking to someone did feel comforting. James looked at the smiling girl before her. She trusted her. The nurse had led James to the psychologist’s office, and she was now sitting on a big comfy armchair, facing a desk covered with paperwork. She was alone in the room; the nurse had told her Dr. Sawyer would be in soon. James quietly took in the new environment. The walls were of a pale sky blue and all the furniture was made of unfinished pine. The broad window behind the desk had no curtains and made the room glow warmly in the midday sun. A large chest throned open in one corner of the room, overflowing with toys. The kind of toys you never owned, that *other* people had, the kind you’d pine for secretly and could play with for hours on end. James, distracted by her surroundings, fingered absently the Rubik’s Cube she had taken from the chest on her way in. However, the situation was too unknown and did not lend itself to play. The sound of the door closing behind her brought her out of the reverie. She sat up in her chair, oddly wanting to make a good impression. The man walked around the chair and to his desk, and it is only when he sat down that James raised her gaze to meet his. And instantly, she knew she would want to talk to this man. A lot. About everything. He smiled at her. “Hello James,” he said softly, smiling, observing her like he’d never seen a little girl before. “Hi…” she trailed off, fascinated by the man’s kind face. His hair had been messily run through and away from his face, the unbleached roots showing rather alluringly. He wore black rectangular glasses and his green eyes shone with life through the thin lenses. He had one of those funny little goatees, and wore a plain grey v-neck sweater. His built was strong, tall, lanky. There was something familiar. There was something in the way he looked at her, she couldn’t look away. After a moment he looked down and back up, breaking the stare. James cleared her throat and stared down at the Cube. One of the sides was all red. James looked back up, and Mulder watched his young daughter speak directly at him for the first time. Scully didn’t know why she attempted to go to work that day. She thought she could do it, but deep down, she knew she was just going through the motions for James. She want to upset James before taking her to school. Every year that passed, the hurt of remembering Mulder’s disappearance intensified and that was hard to explain to her young daughter. She walked out of the building, into her car and phoned the Bureau. She called and made up some excuse about James being ill at school and had to pick her up. While she stared and played with the steering wheel with one hand, Scully never saw the tall, blonde figure emerge from Mulder’s apartment building and drive away. She was lost in her phone call, the thoughts of her daughter and the hurt that accompanied the memories of Mulder’s disappearance. She decided to return to her apartment quickly before she was lost in a river of tears. “Only a few more hours before I have to pick her up,” she thought. She felt comfort when James was home. Her mind was occupied with the talkative and precocious child. “She’s just like you, Mulder,” she thought as she stared at one of her school pictures taped to the refrigerator door and smiled. James was a miracle to her in more ways than one. She gave her stability and joy. The biggest miracle of all was the fact that she conceived a child when she thought she was barren. The whistle of the kettle brought her back to reality. Scully made a cup of tea, turned on the television and dug out a photo album she kept hidden in the living room. It was an album comprised of various photos of her and Mulder taken through the years. Some the photos were distant memories for Scully. As she sat on the couch, she tried to remember the places and times they were taken and had difficulty. Scully felt as though these photos were taken light years away. She turned the pages slowly. There she saw photos of “Mr. And Mrs. Spooky” taken at different F.B.I functions they had to attend, holiday photos, photos on assignment when they had the chance to take a break, or at each other’s apartment acting silly watching movies. These pictures reminded her of times that, at the time, she thought weren’t so great. Those were times that consisted of losing family members and when her and her partner were in more dangerous situations than she could count on both hands. She flipped through more pictures and smiling, “Yeah, these were good times.” Her smiling stopped at the last page. It was the Bellefleur, Oregon trip. She closed the album, curled up on the couch and clutched it closely to her chest. John Doggett reclined easily in his desk chair, dumping the open file onto his folded leg. He rests his jaw against his fist gingerly, and his eyes settled on the small print, black on white, and started jumping from one word to the other, blankly. After a moment, he slapped the file shut with a frustrated grunt and flipped it on his desk. No sense in trying to focus when nothing registered except for the fact that the desk facing his was conspicuously empty. His partner of five years had once again gone AWOL, and John felt uneasy carrying on as usual. Oh, he knew where she was. Over the years they had both learned to trust each other, and would even from time to time let each other in on some more personal issues. This was hard for him too. As platonic as their relationship was, it was still fused with the loyalty law enforcement agents often felt towards their partner, mixed with the terminal loneliness anyone related to the X-Files eventually felt. John cared deeply about his partner. Seeing her so at a lost around this time of year made him feel powerless. There was only so much he could do to help, without feeling like he was prying. Often times he was left just covering for her long absences, wishing there was more he could do. Today, there wasn’t. He worried about the girl, too. James. Such a sweet little girl, smart beyond her years, and already plagued with demons not unlike her father’s, tinted with the trials of childhood. John knew his partner loved her daughter more than life itself, but he sometimes winced at her clumsy parenting. Scully had lost a big part of herself when Mulder had gone, a part that was perhaps instrumental in both her well-being and that of her child. John had met his to-be partner only days after the disappearance, and he witness the painful withdrawal, the slow transformation into the woman she was today. Still as good an agent as she had been, but haunted, broken beyond repair, it seemed. Her pregnancy was at once fortunate and untimely. She needed the child, but had no clue how to be a mother, working around the elusive shadow of a lost lover and a father whose contribution was sorely needed. John’s fingers played nervously on his lips, peering at his phone. In her sleep, Scully could feel Mulder’s arms around her, his breath in her ear as he spoke those words. This scene played over in her dreams many times like it was yesterday it happened. In her sleep, she clutched the photo album tighter; as if it was Mulder’s hand she was holding and began to cry. It was a part of her life she didn’t want to end. A phone ringing in the background interrupted her last moment with Mulder. Still groggy and thinking she was in Oregon, she awoke; disappointed to realize she was in her apartment, holding the photo album instead of Mulder. She reached over and grabbed the phone. “Scully,” she said in a raspy voice. “Um, no,” she lied and looked down at her lap. “I was just reading a book.” She rubbed her hand over her eyes and through her hair. “Is there something you wanted Agent Doggett?” Scully asked irritated. “Thanks.” She smiled, wiped the tears and hung up the phone. Scully put the photo album back and went to pick James up from school. Mulder undid the topmost button of his shirt and absently loosened his tie, eyes fixed on the view bellow his window. A sea of children running out of school and into school buses, all brightly coloured and agitated; some crossed the street, walking home, older ones unlocked their bike from the racks, zigzaging away in small gangs. But Mulder’s gaze followed only one of the colourful dots, as the little girl made her way to the nondescript SUV parked between two buses. Barely a few steps from the vehicle, the girl dropped her bag and its content spilled onto the sidewalk. Mulder saw the child’s shoulder slump, then she crouched and picked up her things as other kids walked over and around her. Another movement caught Mulder’s eye and his attentive irises followed it. His breath caught in his throat. It always did. It was like suddenly he was right there next to them as the suit-clad woman hurried out of the vehicle to help her daughter, red hair catching in the sun, glaring magnificently. Mulder’s hand lingered at his unmade collar, touching the stubbled throat where a lump had suddenly formed. He watched how perfectly her suit clung to her svelt form as she crouched next to the child; how she tucked a crimson lock of hair behind her hair, smiling up at her daughter; how her smiled hadn’t changed, after all those years. Maybe it had. But he didn’t care. He didn’t see it. Disaster averted, mother and child climbed back into the jeep and moments later Mulder was left staring at pavement, and at the oddly shaped oil stain that had been there for years. Soon another car pulled up and took its place. Mulder gulped and looked away. Mulder stared intently at the apple in his hand, trying his best not to act in any remarkable way, as John Doggett was standing right next to him, puzzling over the kiwi display. He bit the inside of his cheek, suppressing a chuckle at the situation — which was, admittedly, quite amusing, if perhaps in a slightly twisted way. Secure in his everyday disguise, Mulder shook a peroxide strand out of his eyes and peered discreetly at the older man, thinking that as it was, he was as perfect a substitute as anyone. Mulder remembered this man as a hard-working, honest agent, and he’d never had a doubt as to how good he would be to Scully. This man was to be trusted, he was sure of it. And the years had proven him right. Later that night, he mused about this. How often he’d gotten so close, so close he could touch, smell, feel, sometimes address. Doggett, James, Maggie… anyone but Scully. He couldn’t bring himself to. Not yet. Perhaps never. James buckled herself into the front seat as Scully drove away from the school. She was silent and looked at her mother with concern and content. She was glad didn’t have to take the grueling bus ride home. Her mother looked drained, as though she had been crying all day. “Was it work? Did she go to work at all?” James thought as she turned to look back at the school. She saw the blonde man’s figure growing smaller as the car traveled away. James smiled at his profile. She never kept a secret from her mother, but after seeing her today, this was something she would wait to tell. This man was different than any teacher there. She felt close to him in some odd way. He made her forget every bad thing that happened to her since she started there. The name calling and teasing was insignificant. She wanted to go to school now just to talk to him. That day, he listened to her for a few hours. James began with all her thoughts and dreams to the problems that happened at school. She opened up in a way she never did with a stranger and it felt good. He didn’t speak much, but nodded and smiled. He let her do all the talking. James’ only thought was that she made a new friend that day. The only friend she had in the world besides her mother. James turned around and took the Rubik’s Cube out of her backpack. “Nothing,” she said as she looked up at her mother and grinned. Copyright © 2001 by mcee and Christine K. All rights reserved.